If you want to make your video content more interesting, it’s essential you have good quality sound. Usually background music can have dramatic effect on a video, especially you have a silent footage or a video with too much annoying noise. If you are searching for a free way to add background music to a video file, then you have come to the right place. In this article, we’re going to introduce you a free desktop application as well as 3 free online methods to help you add audio to your videos and make them fascinating. To add audio to video, here we highly recommend Gihosoft Free Video Converter. 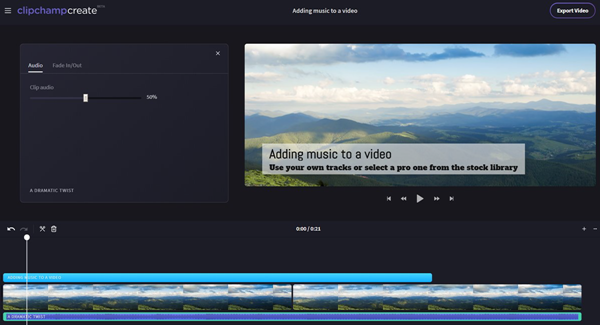 With it, you can easily add audio to video, or even replace the original audio track with a new audio file. This powerful tool also enables you to convert any videos to MP4, MKV, MOV, AVI, WMV and other video formats, as well as change the music files to MP3 format at one go. Easy, safe and completely free to add audio to video without any quality loss. Supports almost any video and audio formats, including MP4, AVI, MOV, MKV, WMV, MP3, WMA, AAC, OGG, etc. More advanced editing features let you customize the video like trim, crop, add special effects, watermark and subtitles. You can directly transfer video from the software to mobile devices like iPhone, iPad, or Android phones. Download and install Gihosoft Free Video Converter on your computer, then run the application. You can either click the “Add Media” button to import your video files, or simply drag and drop videos files to the program. Click the “Edit” icon to go to the editing window. Then tap on “Audio” from the top menu bar. Now select the audio track that you want to add by clicking the “…” button. You can also mute the audio that came with the video by unselecting the “Keep the original audio”. When all is ready, click “OK” and select any format you want as the output format from the right panel. If necessary, you can change the video parameters like resolution, bitrate, etc. Finally, click “Convert” to export a new video file with background music to your computer. Some problems may occur if you download software from the web. They might have viruses, malware and unwanted things which can harm your computer easily. If you don’t want to install any problem to add music to video. There are many websites that offer the same service with no need to download any software. Below are the 5 best websites to add audio to video online, have a look. AddAudioToVideo is one of the best online website to add audio or music to a video file, or replace the audio of the video with selected MP3 audio file. It is completely free to use and the uploaded files will be removed after a while from the web. Very easy to use, just select the video and audio file, then click the “Upload” button. Uploaded files are removed after a few hours. MP3 audio and AVI, MP4, MOV, WMV video formats are only supported with this program. MP3Care is another online application that people mostly use to add audio to video files. 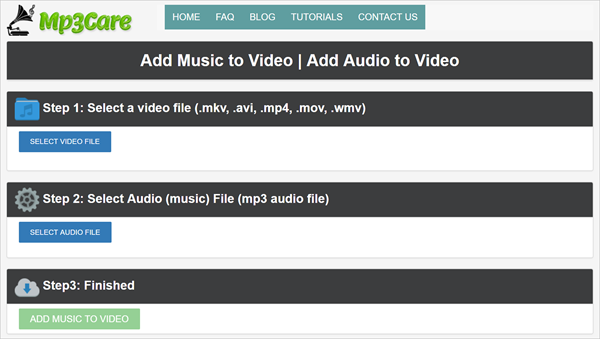 This website supports input audio in MP3 format and replace the existing audio in the video file if it has a audio. The video formats supported include MKV, AVI, FLV, MP4, MOV and WMV. Completely free, there is no requirements to use the application. Simple to use, you can add music to video in 3 easy steps. Only MP3 audio file are supported. 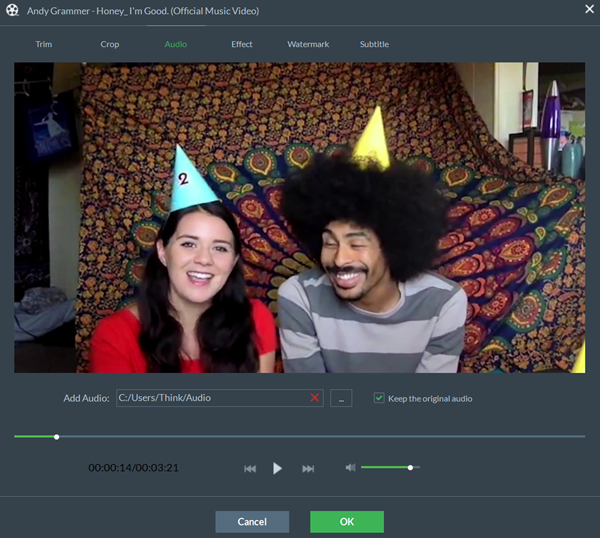 Clipchamp is a simple but powerful free online video editor that makes it easy to add great audio to your video content. You can easily trim or cut the audio track to fit the length of your video. This application also works with images and photos where you can add sound separately to create a video slideshow with background music. It allows you to layer sound, you can add multiple audio tracks to your video to create a soundscape. 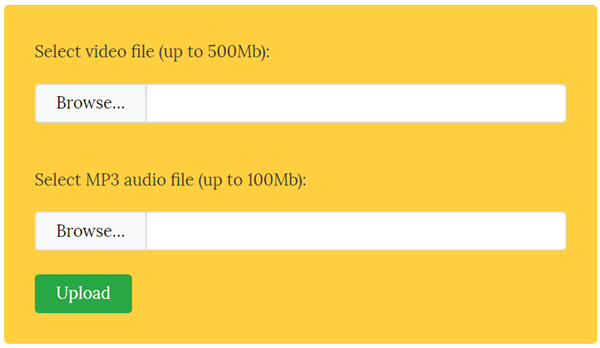 You can get professional audio tracks and sound effects from Clipchamp’s stock library. You need register a free account and log in to add audio to video. As you can see, adding music to a video for free is as simple as it gets. You can either use the free desktop application or one of the free websites listed above. Coming towards the end of the discussion, we came to a final verdict that Gihosoft Free Video Converter to the the best tool to add audio to a video file. If you know any other way to add audio to a video, share it to use by leaving a comment below.